Nearly 100 million Takata airbag inflators have been ordered to be withdrawn globally. Canadian auto dealers will be prohibited from selling some unfixed recalled vehicles if a bill before the Senate passes. The Strengthening Motor Vehicles Safety for Canadians Act, has undergone first and second reading in the Senate and was returned to the Red Chamber from committee in late November. Proposed amendments to the current Canadian Motor Vehicles Safety Act contained in the bill would directly affect the sale of some recalled vehicles. It would give the Canadian Minister of Transport the authority to prohibit the sale of a vehicle that is subject to a notice of defect or non-compliance. CARPROOF, a data company that tracks information for the automotive industry, estimates one in six Canadian vehicles has an unfixed safety recall. CBC News recently checked 200 vehicles that were for sale across Canada and found about one-sixth of them had recalls that remained unfixed or open. Currently, the Canadian Motor Vehicle Safety Act does not have authority over the actions of individual vehicle owners, auto dealers or private sellers. Once a recall has been issued in Canada, the vehicle’s current owner holds the obligation to ensure recall work is carried out. Should the owner be a car dealership, it would be responsible. Laghi said he wouldn’t guess when the third reading might happen. The ability of the federal government to fine automakers using administrative penalties instead of taking them to court, which is the current process. The ability for the minister to name an investigator who can go inside the automaker’s facilities and implement a better safety procedures after a recall. The federal government getting immediate recall powers, rather than waiting for a notice of defect to be sent to vehicles owners from the manufacturer, which is the current procedure. Members of the Automobile Protection Association addressed the Senate committee in November, in support of the proposed changes. The current laws governing the sale or even rental of new or used vehicles, transfer of title, and mechanical fitness of vehicles on the road fall under provincial authority. Every province has a different set of regulations. “Dealers may sell a vehicle with an outstanding recall unless a ‘stop sale’ or ‘stop driving’ order applies,” the Ontario Motor Vehicle Council, which regulates the sale of new vehicles, says in a bulletin to its members. Auto dealers can sell recalled vehicles “as long as the safety recall is disclosed on the contract in a clear, comprehensible and prominent manner,” OMVIC spokesman Terry O’Keefe said in an email to Automotive News Canada. In an effort to unify how provincial bodies handle recalls, members of the Canadian Council Motor Transport Administration met in late November and confirmed the working group should continue its discussion on improving vehicle recall completion rates. The CCMTA coordinates all matters dealing with the administration, regulation and control of motor vehicle transportation and highway safety. Membership includes representation from provincial and territorial governments as well as the federal government of Canada. “An immediate next step for the working group is to identify roles and responsibilities associated with achieving this objective,” is all CCMTA spokeswoman Eileen Melnick-McCarthy would say. 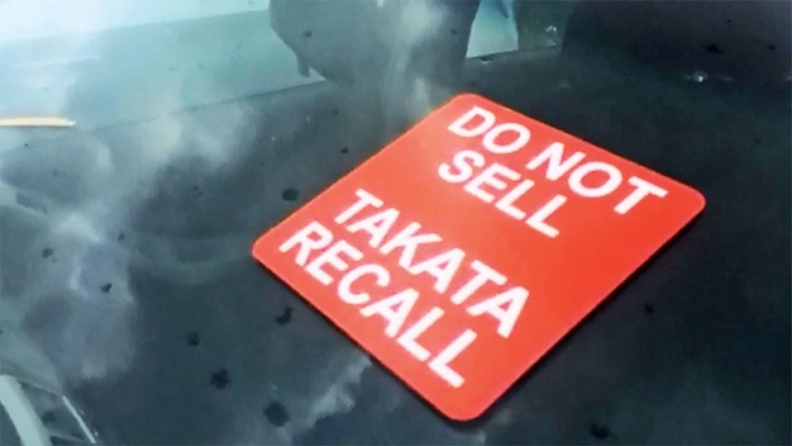 The issue has been controversial in the United States during the ongoing Takata airbag recall crisis, now linked to 11 U.S. fatalities and 180 injuries. It is legal for dealers to sell used cars with open recalls in the United States, but illegal to sell new cars with recalls. AutoNation, the largest U.S retailer, voluntarily stopped selling such vehicles last year, but recently began doing so again after legislative efforts failed.